The United States Congress designated the Mill Creek Wilderness (map) in 1984 and it now has a total of 17,173 acres. All of this wilderness is located in Oregon and is managed by the Forest Service. The southwest-tending drainage of Mill Creek makes up 85 percent of the Wilderness, with Marks Creek drainage accounting for the difference. Both creeks are tributaries of Ochoco Creek, and home to small trout. The steep, broken ridges that drop into Mill Creek rise to Bingham Prairie in the northwest corner, a virtually flat plateau with open meadows and a lodgepole pine forest. In 2000, a lightning caused wildfire burned over half of the wilderness area. Though much of the fire burned at a stand replacement, high intensity, the area is quickly recovering and there are still some examples of an exemplary climax forest (one that has reached its peak of growth) of ponderosa pine, providing habitat for elk, mule deer, bobcats, mountain lions, and the occasional black bear. Two eroded volcanic plugs distinguish the northwest-central portion: Twin Pillars, with vertical walls rising 200 dramatic feet above the forest, and 400-foot Steins Pillar, just outside the southwestern boundary. North of Twin Pillars lies rugged, rocky Desolation Canyon, aptly named since its lack of trails discourages most human visitors. Summer months are usually hot and dry. Snowfall typically blankets the ground from mid-November through March. Four trailheads ramble out into about 18 miles of trails, each located adjacent to small, rustic campgrounds: Bingham Springs, White Rock, Whistler Point, and Wildcat. From the Wildcat Campground starting at Twin Pillars South Trailhead, the Twin Pillars Trail climbs past Twin Pillars to Bingham Springs, about eight miles in all. If you want to stay overnight, there are plenty of pleasant campsites near the water. Due to after fire affects and limited trail resources available, trail conditions remain in primitive condition. Visitors should expect to encounter many downed trees across trails and heavy brush in segments of trails. 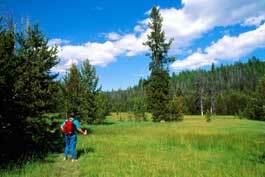 Planning to Visit the Mill Creek Wilderness? How to follow the seven standard Leave No Trace principles differs in different parts of the country (desert vs. Rocky Mountains). Click on any of the principles listed below to learn more about how they apply in the Mill Creek Wilderness.